As planned, Ms Rabbit - the ambassador for the No Cruel Cosmetics campaign who is visiting us at Cottontails - has been rifling through my cosmetics bag to highlight some cruelty free brands. She was very pleased to find lots of lovely Dr Haushka stuff. They are my very favourite - for bathing, skin care, make up, the lot. They are a genuinely lovely company (I visited their UK base for a biodynamic farming day last year). Nothing they produce is harmful to animals. 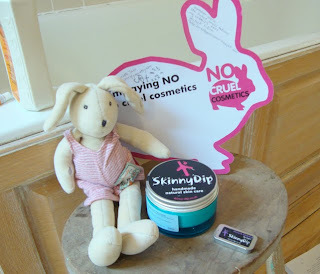 And these goodies are from a cruelty free local producer called Skinny Dip - my friend bought me some for Christmas, they're lovely. 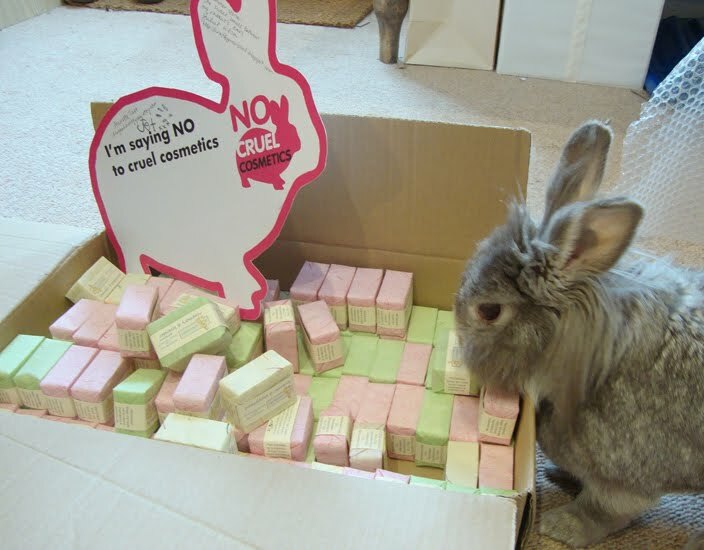 She also found lots of other things from the Co-op and Marks & Spencers - they are the two big name retailers whose cosmetics (and household products) are not tested on animals. It's such a relief to me as it means I can pick up essentials like washing up liquid, soap and so on without having to plan to visit any specialist shops. 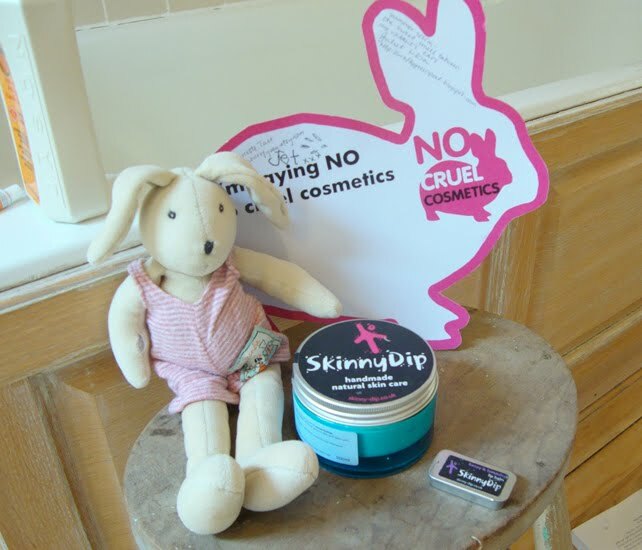 But when I do have time and want to indulge myself though I visit The Apothecary Shop in Ledbury - they sell loads of lovely cruelty free brands, and shopping there is a real pleasure. Ooh...Jason products I love them, although my son 'Jason' gets VERY embarrassed if too many are on show and his mates come round!! 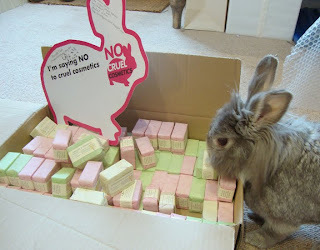 I can vouch that your little gift soaps are scrummy yummy too, thank you. Good range of products! 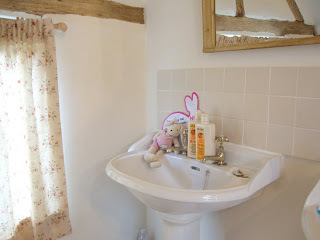 lovely photo of Humphrey and Ms Rabbit! I luurve Co-ops own brand products as they are approved by the BUAV. 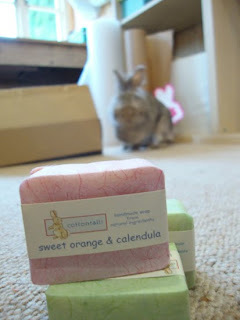 Their laundry products are wonderful and smell gorgeous. Their washing up liquids smell gorgeous too! AND they were the first supermarket to only sell free range eggs! Pat on the back for Co-op! Hi Charlotte! Lovely to hear from you. Oh, Humphrey! How I wish I could give you a sweet carrot or turnip. You are so cute! You're my favorite English rabbit. I loved my tiny soap that arrived with my sweet mousie. She is sleeping on my night stand and the soap is long gone, very much enjoyed. I love Cottontails. We would be very happy for Ms Rabbit to come and stay with us for a while. 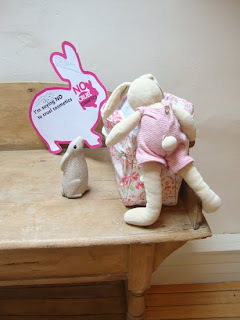 hi Charlotte, looks like Ms Rabbit will be off to visit Jane? I love the CO OP products too and have used their super cheap and super effective shampoos for years. Plus their dish wash - the apple one is heaven! thanks so much for pointing out all the great products out there! 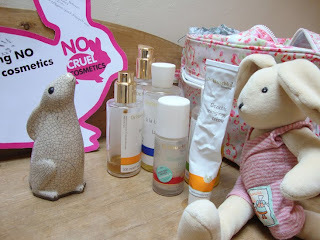 I volunteer for Honeybunnies Rabbit & Guinea Pig Rescue, Leicestershire and we would love for Ms Rabbit to come and visit if she has time :) She can meet my foster bunnies Bouncer & Paw-Paw and rifle through my toiletries!! I use Superdrug, Co-Op, Aldi & M&S for everyday toiletries & enjoy a range of products from them all. I boycotted other supermarkets some time ago.